After a three year break from 40k I decided to return to the hobby. Now iám trying to come up with a good armylist mainly focused on black legion and world eaters. I did some research and found out that close combat is not really the way to go in 8th edition but I like to give it a try anyway. 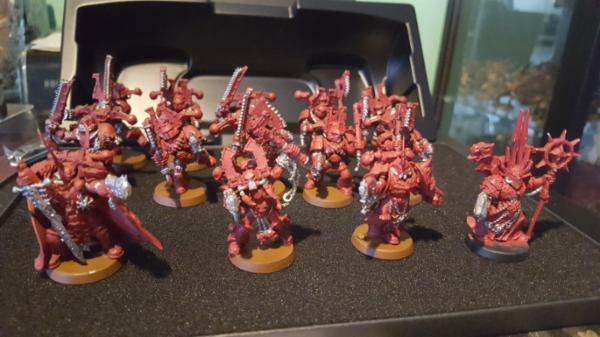 I like to build a list with Abaddon and Khârn because they were soem of the first models I owned (about 15 years ago :X) But I never fielded them. So please help me finalize this list with these two characters at the centre. I got a lot of useful tips from kind people on this forum and reddit and changed my list several times. (added Landraiders, Defilers, Hellbrutes and now removed them again) Ended up with this list. Let me know what you think and how I can make it better. Also want to ask what you guys would suggest for the use of chaos marks especially on rhinos, brutes, defilers, cultists, oblits? The three rhinos with the berzerkers Khârn/ Exalted champion will move towards the enemy ASAP. Abbadon will go with the cultists and move with the oblits providing anti tank fire power. Daemon Prince will follow the Berzerkers where needed. Any tips or critisism is more then welcome I need all the tips i can get. If you have any tips or advice on tactics pelase let me know. I think you are wasting points with the assortment of special characters. Run a barebone chaos sorcerer instead of ahriman. What is your reasoning behind Abaddon? It is also hard to critique a list when you only give a list and not your game plan. Your list also suffer greatly against vehicles and gunlines. Aside from your obliterators you have nothing to do real damage at range. Once your obliterators get destroyed that's game. What is your local meta as well? @LordOfCows You are totally right I made a game plan so please let me know what you think. Would also like to hear your thougts on making cuts to reach 2000 points. I like Abbadon because I owned him for about 15 years now and never fielded him. 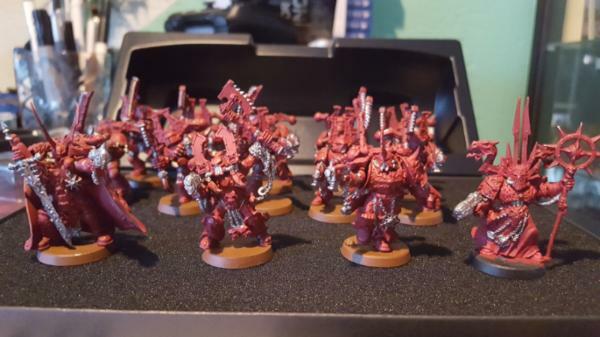 (same goes for Khârn) I dont mind cutting them if it means ihave a far better list. I haven't played a game in about 4 yers so I dont know any local meta atm. The list looks ok but i would make a couple of changes. You don't need the dark apostle and khan. They both do the same job and if you're not buffing multiple units with your characters you're not getting any value out of them. Also a little psychic in the list would help. Warptime and diabolic strength are powerful as is deathhex. I would change the daemon prince for a slanesh one for the intoxicating elixir or just a plain old sorcerer. With the extra points either buy more bezerkers and put a powerfist on the champions. Or make one of those cultists squads as big as possible. Abandons aura plus the tide of traitors stratergem is super powerful. I would move the helbrutes to the black legion detachment for abandons rerolls. Finally if you can find 6 points add a second combi bolter to the rhinos. They're now rapidfiring at 24" so 8 shots a piece at 24 isn't bad for 4 points. Subject: 2000 points CSM Black Legion / World Eaters list need tips and help to finish this list. @small_gods I see your points and changed the list around and got a lot closer to 2000 points but still to many points. Iám not sure what way I should change it. Thinking of dropping the landraider for some Hellbrutes and let Abbadon go on foot with cultists defiler hellbrutes and oblits. Could also remove landraider and stick some CC termies with abbadon. At this point I just dont know. Gave the Berzerker champions fists and ended up removing Khârn for a Dark Apostle to lessen the points and I got kinda scared of Khârn killing my berzerkers or himself. Subject: Re:2000 points CSM Black Legion / World Eaters list need tips and help to finish this list. The list is legal and is an improvement on the original I feel. That's the only problem with abandon, his aura us great, he's tough and great in close combat. He's just super slow. If you drop the landraider for two helbrutes that would start a decent deathball with the defiler and the oblits. If it were up to me I would drop one of the bezerker parry party buses and replace with 10 cultists and use those points to max out a squad of 40 with abandon. That way you can get the most out of his fearless aura as well as his rerolls. Also tide of traitors is really good value with a big blob of 40 and you can screen your deathball really well. It's a tough call with khan as bad rolls will kill off bezerkers. If you're careful you can play around it. Choose bezerkers to fight first. Get rerolls from khan then use pile in move to get more than an inch away so he can't kill them when he is selected. I Kharn removed but sorcerer added also landraider replaces a rhino to put 8 zerkers with the world eater HQs in. Removed Defiler and made the cultist blob bigger 22x and two squads of 10 (only own 42 cultists) list is 1987 points so finally legal. I have some questions though what mark would you give Rhinos/Landraider, what mark would you give cultists and what mark would you give Obliterators. Also if Khârn can't hit his own men doesnt he hurt himself on a to hit roll of 1? The Betrayer : You cannot re-roll or modify hit rolls of 1 made for Kharn the Betrayer in the Fight phase. Instead, those attacks automatically hit a friendly unit within 1". Randomly determine which unit is hit if there is more than one. If there are no friendly units within 1" of Kharn, the hits are discarded. If you are not bound to a specific god by your legion, it only depends of the stratagems or icones you want to use. Khorne for melee units : Icon of Wrath (reroll charge) and Fury of Khorne [3CP] (unit can fight once more). Slaaneesh for ranged units : Endless Cacophony [2CP] (unit can shoot once more) and Icon of Excess (5+ death to the false emperor). Nurgle for survivability or Morale Penality : Icon of Despair (-1cd) and Grandfather's Blessing [2CP] (heal 1d3 wounds or add a slain model with 1w). i.e. Night Lord Nurgle Raptors for heavy cd penality. Tzeentch for psychic : Icone of Flame (extra mortal wound to ennemy nearby on a 6) and Grand Sorcerer [1CP] (cast an additional spell). i.e. How to cast Death Hex after your ennemy wasted all his Deny the Witch ? @Blasphem you are right the rule reads very clear I gues I got misinformed somehow Thank yo ufor clearing it up. So you would go for Slaanesh for the Oblits and cultists. maybe khorne for the rhinos? so they can benefit from the auras aswel? Indeed, best mark for Obliterators is Slaanesh (Nurgle in second position to revive one dead model). 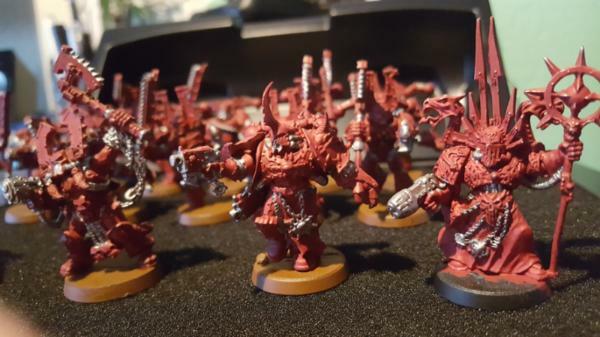 For the Cultists it depends on you gear them, melee weapons = khorne, ranged weapons = slaanesh, but since you don't play big mobs of 40 cultists it doesnt realy matter. I would not waste any CP for stratagems nor points for icon on a unit of 10. But if you want to try a horde of 40 cultists, Slaanesh is realy potent with autoguns, the combo is kinda expensive (3~5CP) but using wave of traitors to deepstrike full size unit and mass shooting key target down with VotLW. (80 BS4+ shoots wich hits T4~5 on 4+, stats it deals 20 wounds for 3CP. Twice for 5CP with Endless Cacophony). Khorne may do the same trick in melee but it's by far worst and dangerous for your cultists. Since your rhinos are World Eaters, the need to have Mark of Khorne (but anyway it will not change anything). thanks again you have helped me so much. It's crazy how much has changed from 7th edition to 8th. That's why i decided to start fresh and turn to World Eaters and Black Legion the reason I picked Chaos in the first place (about 17 years ago ) Fall i nlove with Khârn and Abbadon. Thinking of getting more cultists to make the 1st troop 40 cultists to benefit the most from the stratagem and Abba aura. I could drop the sorcerer to achief that comes down to 100ish points to up the cultists to 40. Although most of my army is close combat focused I think i go with the autocannons on the cultists. Yeah i think that blob of 40 cultists would make the list run well. Having a lot of bodies seems to help a lot in this edition. If you can keep one alive then tide of traitors is really powerful with abandon as you don't have to spend CP to stop them running away! Not sure if I should cut the sorcerer for that. I feel your pain, I'm currently finishing painting 30 plaguebearers, 10 bloodletters and a 3rd t'son daemon prince to update my tourney list. Good ol' models here. Specialy love the old sorcerer, i had the same when i was kid, remember me my youth. I know it may be long, I am painting 20 plague marines and 40 poxwalkers right now, but it worth the work ! Your models look very nice, classics you have yourself there. maybe think about a dry brush and wash on the red armour and same for gun? Altough if you're a veteran I assume you don't need to be told these things right? Have fun with 8th, it is a lot of it. Thank you, yeah you are right. I will stick the sorcerer in just for fun factor..